Haven't had much time to sketch for the past few days. My wife and I were busy having our boat pulled for the winter and doing the usual wash, wax, and put the cover on routine. Had a chance to sit down on my daughter and son-in-law's deck Saturday afternoon in Kent City, Michigan. This is my sketch of their next door neighbor. This afternoon (Sunday 9/30) my wife, daughter, and I went to Art Prize in downtown Grand Rapids, Michigan. No sketching just a lot of looking at art at the various venues throughout the downtown area. There's so MUCH to sketch there, it's hard to know where to begin. This is what I was sketching from the chaise...the ruins of a beautiful old building. The other spread was all done at the main entrance. Bill and Vicky--he's such a patient man! 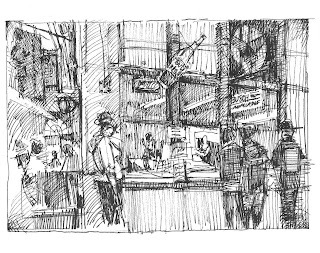 Since it was raining and thundering this afternoon I decided to head over to the Air Zoo which is located in Kalamazoo, Michigan, and try some sketching. During WWII the Navy conducted carrier landing training on the USS Wolverine. Training was conducted on Lake Michigan off shore from Great Lakes Naval Training station. During more than one landing errors occurred and aircraft were lost over the side and into the depths of Lake Michigan. Several years ago one of the lost aircraft, an SBD-3 Dautless, was recovered from the bottom of the lake. Here's a picture of the wreck post recovery. Through a lot of effort the SBD was completely restored and is now housed at the Air Zoo. Here's my sketch of the aircraft as it is now. The Air Zoo is also home to numerous other aircraft. One that caught my eye this afternoon is the PT-17 Stearman biplane. The PT-17 was used as a primary flight trainer for pilots training to fly WWII aircraft. This is the beautifully maintained Stearman that's housed at the Air Zoo. All-in-all a fun afternoon of sketching. 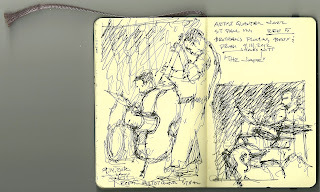 These are little sketches done at our recent USk Chicago meet. 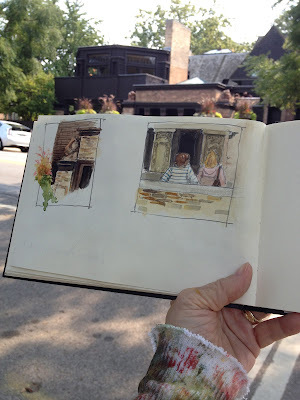 So much to see and so much to take in, I opted to sketch some of the details on the Chicago Avenue side of his home and studio. The first is one of the sculptures above the walkway to the hidden door. The second is of the tourists and the reliefs that line the walkway. 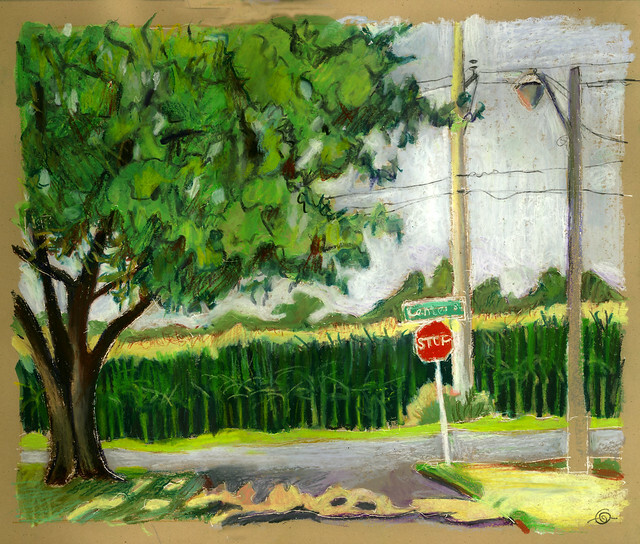 I walked across the street for a closer view for third sketch. It's a detail of the reliefs – the repeated stork motif and lastly a rough rendition of the logo. This yard sale has been going on forever...if it rains they cover things with tarps and move them on the porch, but mostly it's just all over the porch, yard, fence, and encroaching on the two houses to either side. My wife, Nancy, says I never do flowers. This a a basket of mums that we bought yesterday afternoon at a neat general store type place south of Battle Creek. They look great on our deck. Lots of color. So I sketched them tonight. So Nancy...flowers for you from me! Have a fun trip with the kids to New York! As this is my first post...an introduction. That's me concentrating hard and scribbling. The furry bundle next to me is my trusty assistant Emma, our 7 month old White Westie pup. Emma generally works the crowd for free pets (food if you happen to have it) while I work the pen and paints. Which brings me back to me. I'm retired. Which means I'm a "ski bum" and a "boat bum." I spend my winters skiing as a a Senior Ski Patroller and a Level 2 Certified Professional ski instructor. Summers are spent sailing on Lake Michigan on our 1988 Catalina 30 sail boat Amadeus (home port Whitehall, Michigan). In the winter home is Battle Creek, Michigan. That's Amadeus next. Art wise I've been drawing since I was a kid. I'm primarily self taught but have spent years reading and experimenting my way through watercolor and sketching books. I've also taken watercolor classes, and life figure drawing classes at the Kalamazoo Institute of the Arts. I'm also a photographer (something else I've been doing since I was a kid). In back of the camera I do a lot of marine photography...concentrating on most any boat that has sails and on quaint areas where sailboats hang out. I've also managed to shoot a couple of covers for "Good Old Boat" magazine. 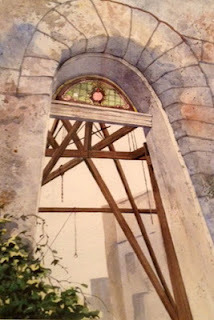 Subjects for my pen and watercolors are similar to that which I take interest in with the camera. I enjoy marine subjects but also enjoy drawing buildings - especially ones that are older, that incorporate interesting shapes and textures such as wood, brick, and stone. I also very much enjoy working with graphite pencils drawing portraits, figures, and most anything else of interest. 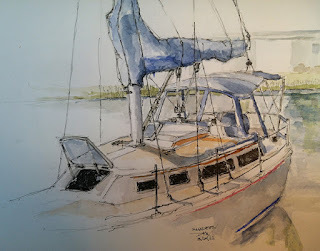 Closing out this first entry are two watercolor sketches that I did last weekend on Sunday. The first is of Clara's restaurant. Clara's, before it was Clara's, was Battle Creek's New York Central railroad station. The tracks once ran right through the spot where I sat sketching. Now the old track route is a delightful, shaded, walking park that extends through the length of town. Turn around from where I sat and you see part of down town Battle Creek and our river, now encased in a concrete spillway. Here's the view. That's it for my first post. Very excited to be a part of this group. 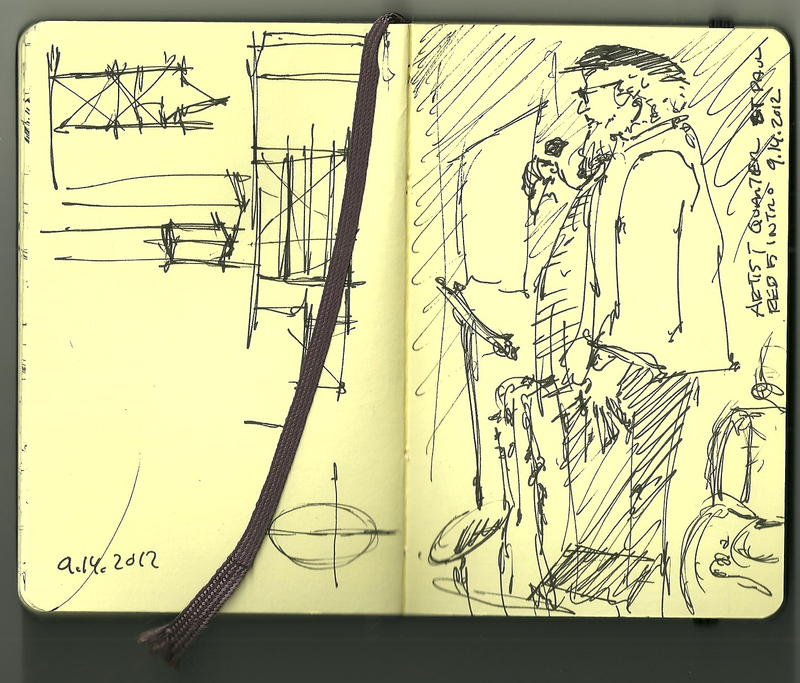 sketchcrawl, 15 Sept., a photo by vickylw on Flickr. 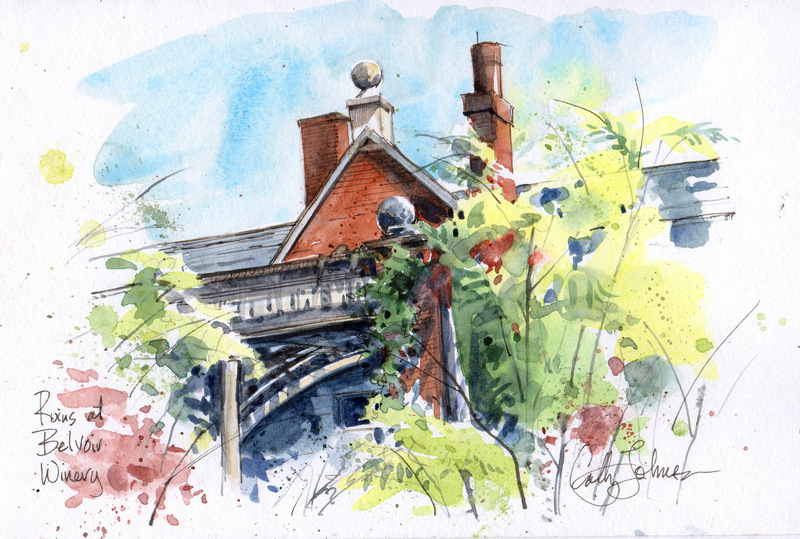 Saturday we met at the Belvoir Winery in Liberty, Missouri for a sketchcrawl. The winery is located in one of the old buildings originally home to the Odd Fellows Lodge. Lots of interesting artifacts and photos are on display from the lodge days . . . including the skeleton of George, one of the lodge's early members, in his glass-topped coffin! I did not get very much down on paper --- there's just so much to draw in this place, it was hard for me to focus. (The cup of tea and turnpike ticket were drawn during the 3-hour drive from our home in Kansas. A bit wonky in perspective). Here, Kate is sketching one of the old buildings that is still in a state of decay and neglect, while sitting on what used to be a twin chaise lounge. There are so many options available to sketch here, both inside and out --- we definitely need to return on future sketch crawls. Fun sketching at the Hotel Phillips, and then at the old KC Parks and Rec building, re-purposed into a theatre! Work in progress...you can see I added color to the Phillips lobby sketches later--I didn't have much time there, because the Jeep was parked at a meter. And on the way home, a super quick sketch with a gorgeous Prismacolor Ebony Jet Black Extra Smooth sketching pencil as we drove across the I-35 bridge as slowly as Joseph dared! It has been a while since my last update. 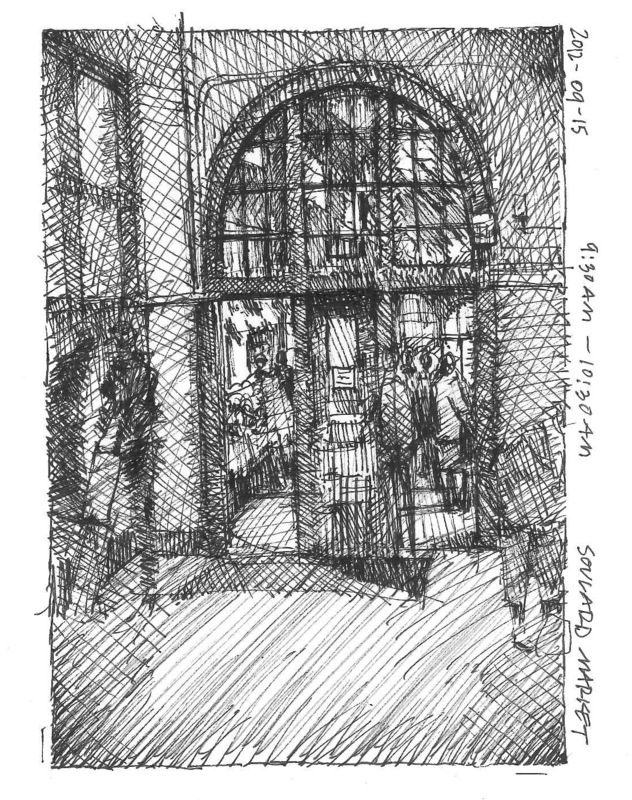 This weekend I was back to sketching at the Soulard Market in Saint Louis. One way to work for me regarding subject matter is to find a spot to make a composition and wait for your subject to walk into view. This works better than perpetually looking for subjects. 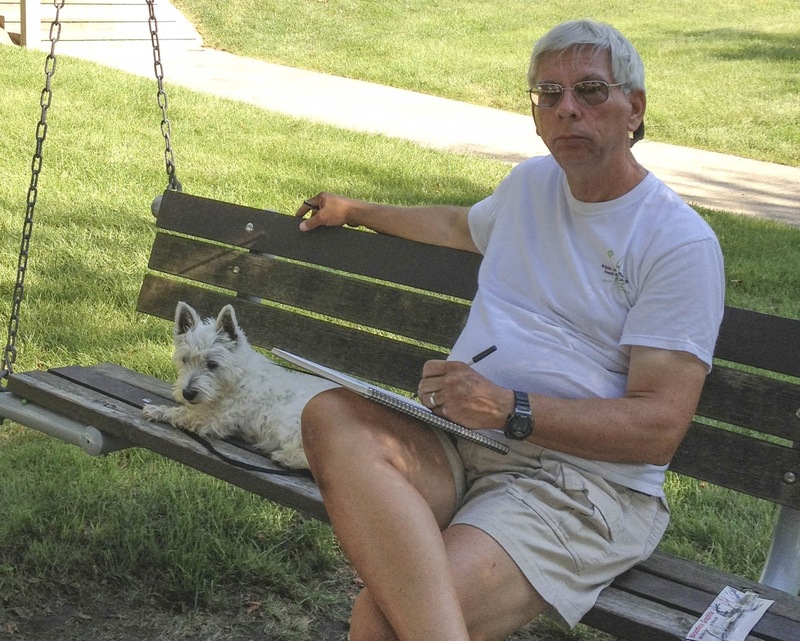 They just stroll on by and see me sketching. I get lots of neat conversations and meet people that way. Everyone seems really excited about artists working. 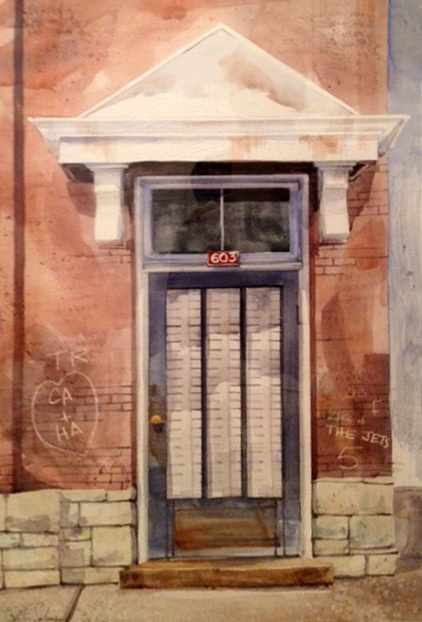 Many of my sketches of the Soulard Market include the round-topped doorways that are on each of the four wings and on the front and back entry to the market. 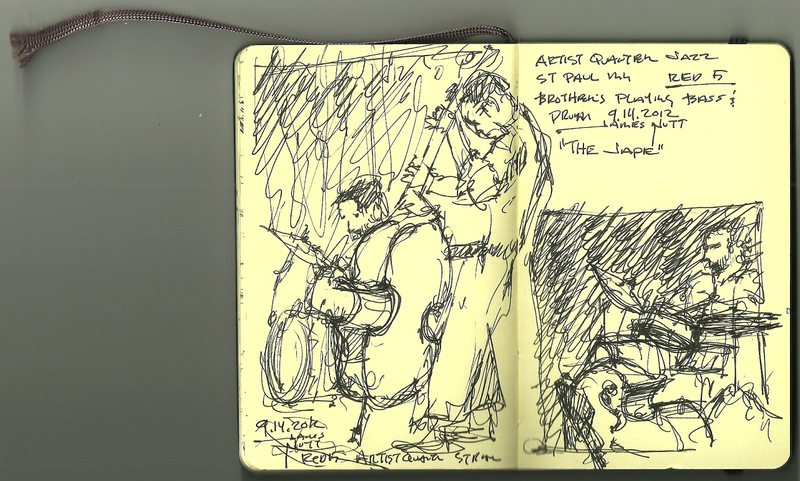 The way I work is first to draw a series of live sketches. As I sketch, I take reference photographs. The photos aren't used while these preliminary sketches are made. 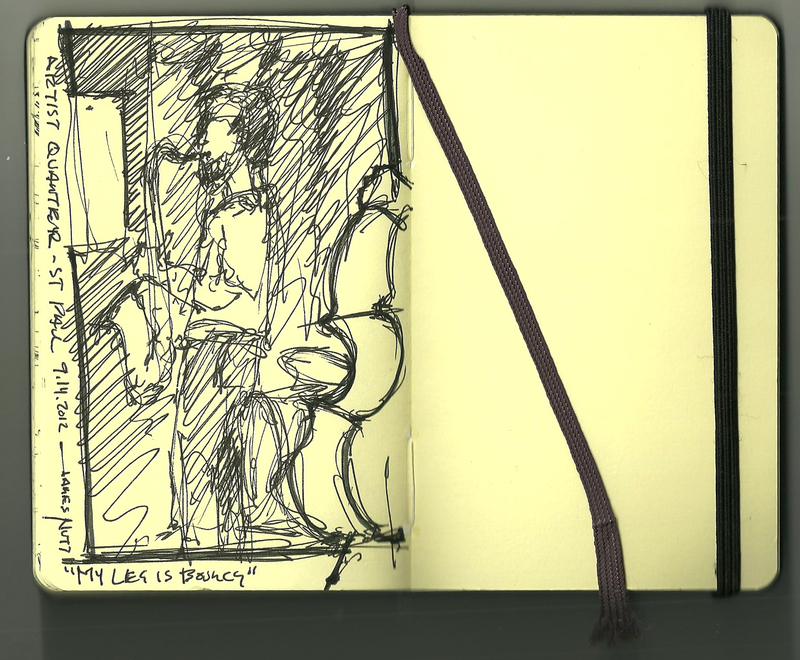 The sketches only serve to solve compositional problems and keep the image active by drawing from life. The energy and concept of the thing to be drawn is what's important. Later, I take the sketches home and use them to develop painted works. Sometimes I do like to do watercolor sketches on location, but usually I find black and white is most portable. I struck up a conversation with a lady who walked into my composition with her many colorful bags and scarves. She seemed interested in seeing the final work. 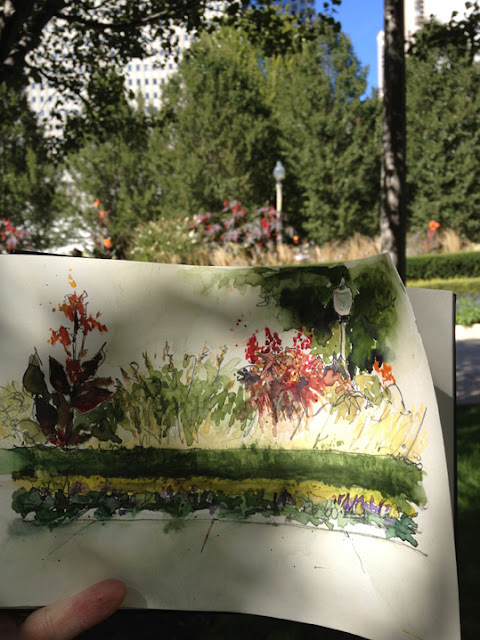 Painting and drawing outdoors like this is a great way to build contacts that are interested in your work. I am working to have a better digital portfolio to carry around as that is really helpful. 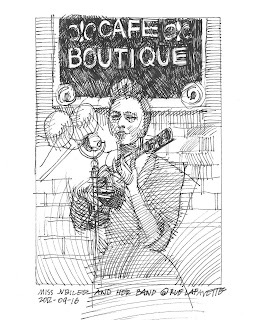 Then, I turned 90 degrees and drew Joyce's Corner across from Frandeka's Meats. There is a constant stream of people passing changing the scene. People push strollers and shopping baskets on wheels. They pause at Joyce's for a hotdog, brat, or polish sausage and beer among other things. The vendors saw me drawing them and wondered what I was up to. Later I showed of my sketches. Sometimes I am self-conscious about how my sketches focus on the motion and stances more than a finished illustration. It isn't what people are used to in sketches. A trick I have been using lately is to carry a small cut mat with a wire across from corner to corner making an x in the center to frame up the subject. I hold it out in front of me to find the center with the x. For some reason I have been playing with aligning something with the visual center of the frame whether or not it is the actual focus of the composition or not. Something just snaps in place in my mind in the composition when this happens. Sunday Lisa and I went over to Rue Lafayette to watch the Miss Jubilee band play. Again, here the focus is on the energy and composition of the moving scene versus any exact edges. It reminds me of when the grade-school teacher said not to draw hairy lines. Are hatchy non-edges the same thing? I don't know really. 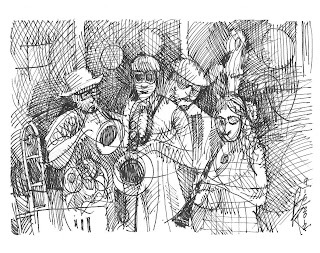 Miss Jubilee and her band are really really great! They all switch off on instruments and they really know how to make live music and to get the audience hopping. There were 4 different couples who got up and satisfied their urge to swing dance. P.S. 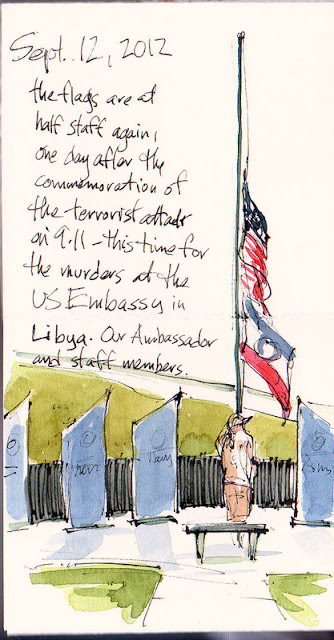 - I am looking for information about when the Monday Sketchers do their thing in Chicago. 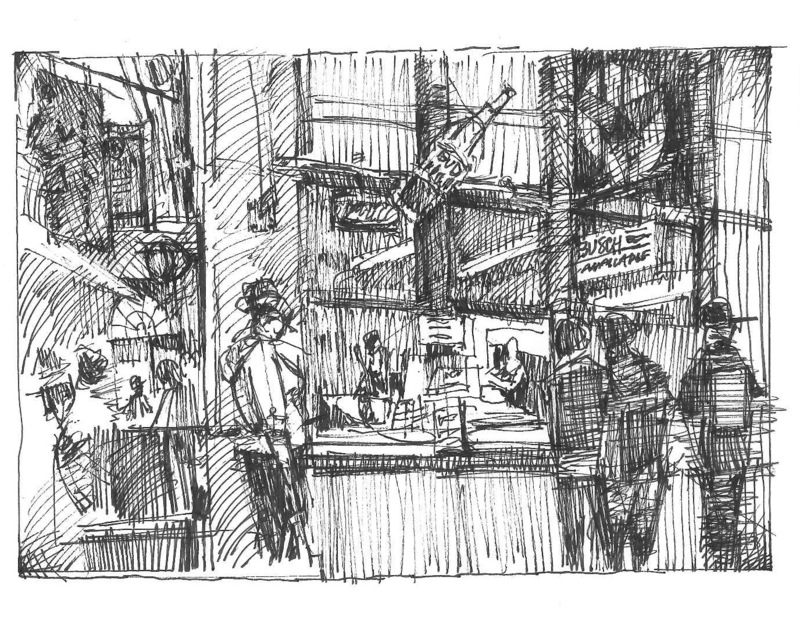 I would like to head up to Chicago sometime, and knowing when some Urban Sketchers up Chicago-way are going to be doing their thing would be cool! If Blogger doesn't catch a spam comment--one that doesn't really say anything about the post you're supposedly commenting on, but does include a link to your business or website that's unrelated to what we're doing here, it WILL be removed and reported. Tonight I had the privilege to see the Red 5 at the Artist Quarter in St Paul. A good friend and important mentor to me has side stepped architecture for a bit to produce a record company and help a great group. We got there slightly early to get good seats. Also, I have been on a mission to capture people better. The first sketch of the guy introducing the band is my favorite so far. I showed it too him. He said he had been sketched many times but he thought this captured him the best. Especially the beard. A you can see I was really enjoyed sketching the shape of the stand up base. The second sketch leaves out some of the band but my favorite part is watching these two brothers work together. 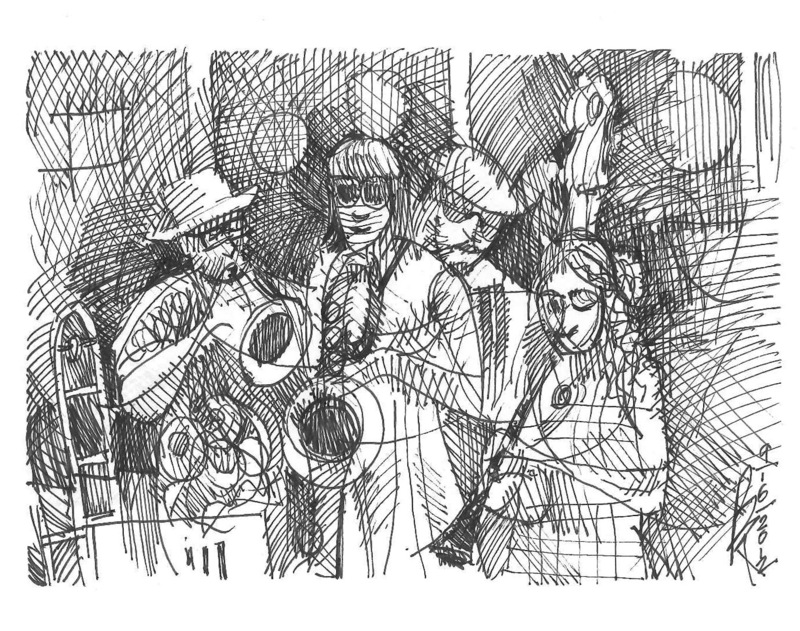 This last sketch was of the saxophonist and the bass working together. The tune is "my leg is bouncy" and my sketch should have caught more of that! Any way, sketching in a dark club is a lot of fun and I enjoyed it. Funny, guess I've always been interested in urban subjects. Someone contacted me this week to ask if I'd painted something called 603 Urban. Who could remember? So she sent me photos of some of the paintings she had--and yes, they're mine, from the 70s or 80s! Same thing happened last week, with someone else...what IS it about my past coming out of the woodwork?? 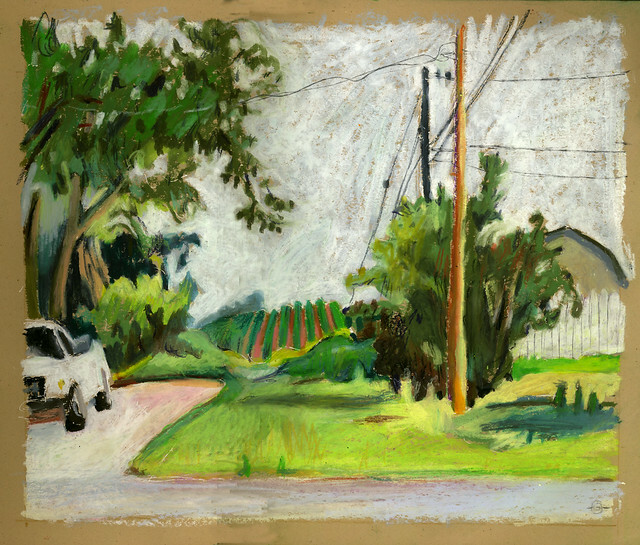 I am working towards an exhibit of drawings of Cedar Falls, Iowa, my home for over 25 years. As I draw Cedar Falls, I have discovered themes. EDGE OF TOWN is one of them. Here is a drawing I did today, Thursday, September 13th. 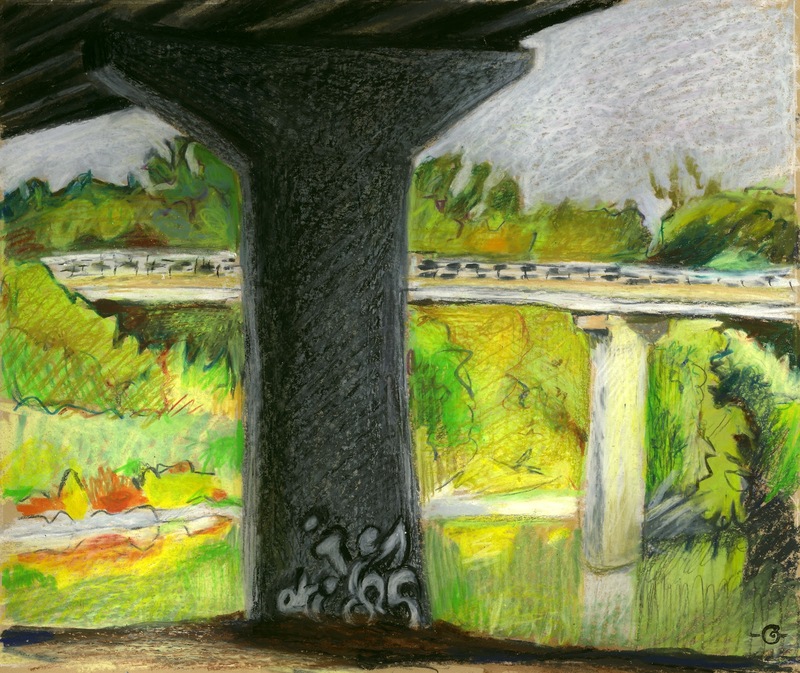 I sat under the highway bridge that crosses over the Cedar River above Washington Park. The further bridge is a bicycle/pedestrian bridge that leads to an extensive trail system within George Wyth State Park (all the trees and color beyond). The river is a wild place. This river front, city park is a wild place. It is only a few blocks from my old-town residential neighborhood. On walks, I routinely see fox, raccoon, bald eagles, and heron. All while semis rumble overhead on the highway. I'd been attracted to drawing these two bridges for awhile. When I discovered the freshly applied graffiti at the base of the bridge pier the other day, I knew I had to act fast. The public works department is super vigilant about painting over graffiti. It usually doesn't last more than a couple weeks. My husband is in charge of the flags for the local Legion post...so it was his sad duty to lower them again, yesterday, for the attacks on our embassies in Libya, Yemen, and Egypt on the anniversary of 9-11. They will remain at half staff until Sunday. 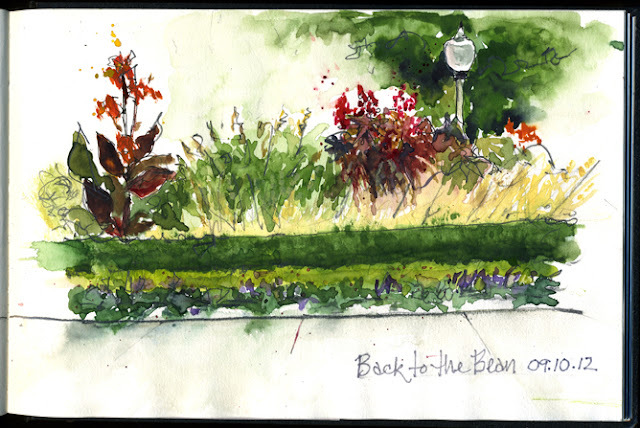 Our Chicago Monday sketch group met at the Bean in Millennium Park this week. I've sketched there several times this summer. This time I chose a different point of view. I did this sketch with my back to the sculpture so in more ways than one it was "back to the Bean". The day was a beautiful preview of fall, cool, sunny and delightful. Ceilidh's Wednesday, a photo by vickylw on Flickr. My Scottie, Ceilidh, had a rough morning yesterday . . . . and spent the rest of the day sleeping. First I combed her shaggy mess, then took her to the dog groomer's -- I sat outside and sketched the shop after taking her in. Later, after picking her up, I dropped the car off where they were fixing a leaky windshield, and we walked home. She did NOT enjoy the walk -- she's getting lazy! Last month, August 2012, I was incredibly fortunate to spend 11 days in Stockholm, Sweden. 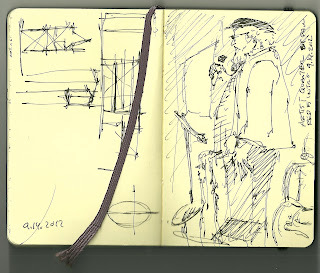 My husband was invited to present in Stockholm University, and I tagged along with a goal to sketch. And sketch I did. Stockholm is one of the most beautiful cities I've even seen. And Gamla Stan - the Old Town - is a mind blowing experience. 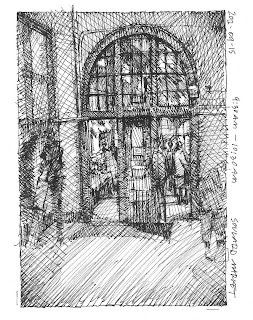 Then my luck turned even brighter - I got together with Nina Johansson and we went to sketch the Old Town again. I just couldn't get enough of it. 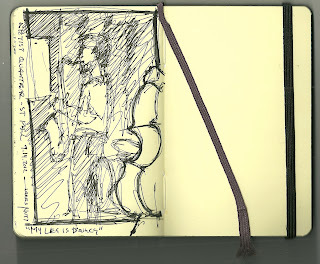 Here's Nina and I sketching in the narrow alley Skeppar Olofs Grand. Finished with Skeppar Olofs alley Nina and I met with Ed Harker at Stortorget, which means The Big Square. 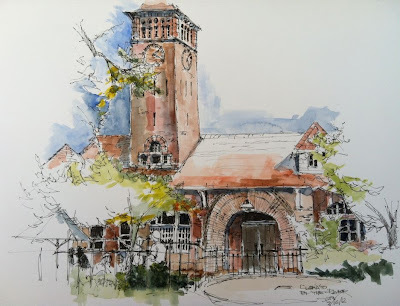 Ed is a sketcher from Bath, England. This outing turned truly international. We sat in a cafe and sketched the old Stockholm. My view was Swedish Academy and Nobel Museum - the very place where they decide who wins Nobel prizes each year since 1901.